When buying property anywhere, it is always recommended to read as much information as you can from official sources. 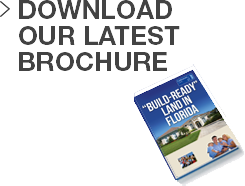 Buying land in Florida is no different. We have compiled as many resources and information together as we can to help you make a buying decision. http://dor.myflorida.com/dor/property/taxpayers/ This is a link to the Florida Department for Revenue, which gives info on tax rates, tax billing, exemptions, property tax, etc. http://www.irs.gov/businesses/small/international/article/0,,id=96696,00.html This is a link to a section within the IRS website that has info on obtaining Taxpayer Identification Numbers (TIN). http://ira.property-appraiser.org/PropertySearch/ link to Osceola Property Appraisal Website..